I've always been impressed with the power of Social Media. But it has never made quite a personal impact on me like this week! This week has been especially hectic for me because I had the privilege of attending several fashion shows because of Philippine Fashion Week. I would have never gotten the opportunity to go if it were not for the power of Social Media! I was able to get a ticket to the SM Department Store fashion show because of my sister and her line of work which allowed her access to some tickets to give to us. I was able to attend the same fashion show last year. Which is why I had wanted to attend more fashion shows but had no idea how. Until one of my cousins was able to get free tickets to the Cyber Shot Luxe Wear Collection Fashion show after reading a twitter post from one of her blogger friends! Then a day after that, my cousin (who is almost always online and checking out her favorite social networks) joined a contest on Twitter to get that much coveted Oxygen Clothing Fashion Show. We thought all would be lost but then, MAGIC HAPPENED. @OxygenClothing set up a contest so that the first 50 people who retweets about this event gets an invite! And YES, we three got the invites! I'm really glad that I'm now living in this advance age of technology and communication. Who would have thought that Social Media would have this big of an impact on our society – that with just one click, you can access information and people and interact with them! And boy do we love to talk and make our "voices" heard! People are already recognizing the power of Social Media—its ability to make personal and direct contact AND initiate dialogues directly to their market. It’s all about knowing your competition, making the right connections and establishing a social presence. 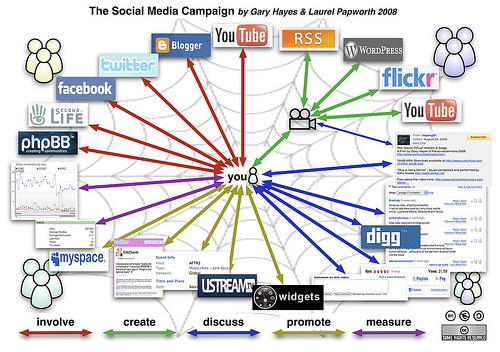 By looking at this chart and relating it to my most recent experience on how Social Media got me, I now see how companies, businesses, and even aspiring bloggers like me can capture their “market.” They all use the social media and the social networking sites to involve and create meaningful connections to people. Once the connections have been made, you want to be talked about! Remember my fashion show story? That’s how they captured US—the market! They made all this buzz about how great their company was and invited people to watch the show – even giving access to the everyday ordinary masses! And see its effects on the online communities! People are now promoting this company, or this business, or this certain item or product because of the impact that social media has made on them! There is no better advertisement than the word-of-mouth advertisement! And word-of-mouth now would mean this social media platforms that almost everyone has an account on and checks on an almost daily basis. Now here is the tricky part, measuring and MONITORING your social market campaign. You can’t just create all those accounts all over the sites and leave it and cross your fingers and hope that it works. You have to take deliberate action if you want to manipulate social media to your advantage. This is where NETVANI comes in. Netvani is a social media monitoring and marketing tool that will help you to expand your social presence and do almost everything of what I just mentioned earlier. Its goal is to guide you into discovering your customer's or market's minds and make it easier for you to promote and campaign whatever you or your company is offering. Netvani is there to help you monitor your competition, research your market, engage your customers, build your community, and even manage your social web accounts! You can even set up a team who can visit, monitor, and manipulate the available tools on the site. Everyone in social network marketing knows that its all about knowing the right keywords then updating, connecting, and posting on those social web accounts that take up a lot of time (and for some, even money!) and effort. Through Netvani, it makes your life easier by giving you secure access to all of your accounts in one single and comprehensive view. Also like what I mentioned earlier, its all about connecting so Netvani also provides customer feedback and a quicker way to engaging your customers through the social network accounts you have enrolled in Netvani. For me, one of the most important features of Netvani is that it allows you to view intelligent reports that will give you insight by pointing out areas where you need to improve in your social media campaign. Best of all, Netvani also gives you 30 day free trial account just so that you can have a taste and see how effective this tool can be for you! Social Media is a great tool if we know how to use it. So try this out and see how it will work for you. Thanks thanks.. I will be featuring later the fashion shows I was able to attend. I still can't believe I was able to go! Im quite impressed really with their Social Media Marketing skills.. the place was packed!! !